(Bloomberg Opinion) -- The reaction from Paris to Theresa May’s crushing defeat on her Brexit vote on Tuesday has been telling. Where people in the U.K. have assumed until now that President Emmanuel Macron was more concerned about grabbing finance jobs from the City of London, his focus appears to have shifted since the emergence of the gilets jaunes protesters. This week, France’s preparations for a disorderly British departure from the EU were all about fishing, not banking. A jacketless and confident Macron, speaking to a town hall meeting with French mayors, promised to defend the rights of French fishing fleets if May tried a second tilt at finding a deal with Brussels, or failed to find agreement. He was backed up by Prime Minister Edouard Philippe, who promised to support the French fishing industry as part of a 50 million-euro ($57 million) spending package designed to limit the damage of the U.K. crashing out of the EU without a deal. It may seem odd to single out fish, rather than finance, when Europe is potentially two months away from a chaotic U.K exit. But the EU’s capitals have already left little doubt that banking will have some kind of protection, whatever brand of Brexit we end up with. Both Paris and Berlin want to preserve the continuity of contracts and some kind of cross-border access for U.K. finance firms. There’s little desire to destabilize the capital markets just to punish London. Nor is there much interest from Macron’s ministers in dangling more tax breaks to attract City of London jobs at a time when the yellow vests are rioting over inequality. But maritime trade and the fishing industry are thornier topics for the French, with a no-deal Brexit offering immediate advantages to the Brits. Fishing accounts for a tiny slice of GDP in France, but it carries political weight. The U.K. would have every interest in reclaiming control of its waters from the EU, and fish – unlike bankers – don’t respect borders. Britain has a natural advantage when it comes to the aquatic stock in the North Sea: It exports two-thirds of its catch to the EU, and French boats fish regularly in British waters. Without that access, EU-run waters become immediately more crowded and less profitable. Even if a version of May’s deal wins through in the U.K., it contains no agreement on fishing rights as yet. The gilets jaunes might have further cause to take their anger to the streets. It’s a similar story for trade across the English Channel. France enjoys a $4.5 billion trade surplus with the U.K., but unless the U.K. remains in the European single market, it would have to erect barriers, whether through tariffs or regulatory checks. 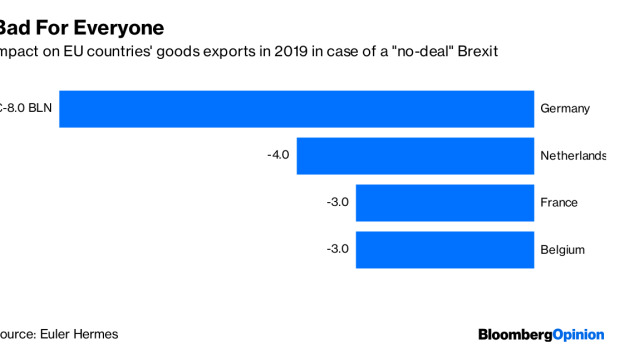 A study by credit insurer Euler Hermes last year estimated that France would lose out on some 3 billion euros ($3.4 billion) of exports in 2019 in the event of a no-deal Brexit. The British economy has more to lose in a no-deal scenario, but this isn’t a zero-sum game. As with fishing, there will probably be more competition in the EU ports business if the U.K. departs the European customs union. That’s because there will be a race among ports in France, Belgium and the Netherlands to offer the speediest route for getting goods checked at the border with Britain. Hence why Paris is keen to show it will do anything it can to speed up investment in port infrastructure. These issues will find their way into any future talks with the U.K., as Macron suggests. If Brussels offers concessions on the Irish backstop – the contentious promise to maintain an open border between Ireland and Northern Ireland – then Paris and other capitals will probably ask for something in return, such as reciprocal access to fishing waters. While Paris and Berlin have made real progress on no-deal planning for the banking industry, there’s still an ocean to cross on the maritime business.